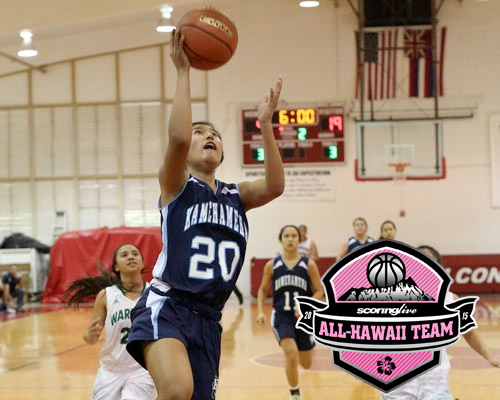 Following in the footsteps of Casey Poe, Riana Arima became the second straight Kamehameha-Hawaii player to take top honors in the ScoringLive All-Hawaii Division II Girls Basketball Teams. Joining Arima on the First Team is Hawaii Baptist guard Rylie Wada, Kaimuki swingman Victoria Kintz, Honokaa forward Eliyah Fernandez and Damien center Melina Souza. Arima, a 5-foot-8 senior shooting guard, led Kamehameha-Hawaii to a 11-5 record and a third place finish in the New City Nissan/Hawaii High School Athletic Association Division II Girls Basketball State Championships. During the four-day state tournament Arima averaged 19 points, 4.3 rebounds, 2.0 assists and 5.3 steals per game. She also set a career-high in points in the opening round against Damien with a 31-point outburst on 12 of 14 shooting. "She's a smooth player," said Damien coach Paul Tanaka. "In all my years of coaching basketball, of all the teams we played this year, I think she's probably the most all-around best basketball player that we played against — whether it be defensively, offensively, or even when she moves without the ball, just her presence on the court was something that we had to always watch." Tanaka also applauded Arima's demeanor on the court. "She's a fierce competitor and she keeps her head," said Tanaka. "Even though her team was losing to Hawaii Baptist in the semifinals, she didn't get real mad or anything. She just keeps her head and she kept playing hard." What set Arima apart from most players was her ability to be a marksman from anywhere on the floor. 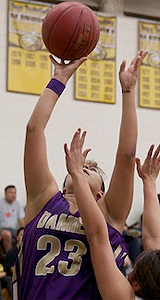 "She's not afraid to shoot it," said Honokaa coach Daphne Honma. "Basically we had to always make sure she was covered and that she wouldn't get any good shots off. That's what made her so dangerous, was that she can shoot. If we would sag down in the paint on defense and she got an open shot, she would knock them down." Wada, a 5-foot-4 senior guard, helped Hawaii Baptist compile a 25-4 overall record, including a 14-0 mark in the Interscholastic League of Honolulu. 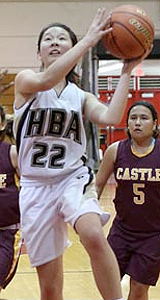 Although she averaged a modest 10.4 points per game, coaches praised her for being such a well-rounded player for the Eagles. » Download a printable version of the 2014-15 Division II All-Hawaii Team. "I thought she was a great overall player," said Honma. "She's smart, she has good ball handling skills, she can shoot it and she can defend. I think she was more of a complete player than most of the other girls." Wada was also chosen as the ILH's most valuable player in all of Division II. "I thought she was consistent throughout the entire year," said Saint Francis coach Chris Hoe. "Whether it was her scoring, her energy, or he defense, she was very consistent. She stepped it up and did whatever was needed for the team to win. Kintz, the youngest member of the First Team as a sophomore, helped lead Kaimuki to its first Oahu Interscholastic Association crown since 2010. 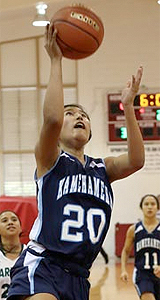 She averaged 17 points per game, tallied 27 3-pointers made and was a second-team selection for the OIA East all-stars. "Her ability to score and her leadership made her such a good player," said Castle coach Joseph Lilio. "She takes the ball to the hoop and was fearless going into the lane." The sophomore swingman's penchant for driving into the paint often forced opposing teams to change up their base defense. "We had to go to a box-and-one on her," said Hoe. "We usually play man or zone, but we had to put one player on her the whole game. We had to change up our defense because we knew that she was their team so we knew we had to stop her. She would drive and score, or penetrate and kick out. We always needed better help defense on her." 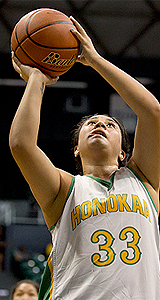 Fernandez, a 5-foot-9 senior forward, was the post presence for a Honokaa squad that repeated as Division II state champions. She also helped the Dragons finish with a 10-2 record in Big Island Interscholastic Federation play, with both losses coming at the hands of Division I state champion Konawaena. Fernandez averaged 10.7 points and 10.4 rebounds per game, according to coach Honma. "She was very strong in the post and we had no answers for her in states," said University High coach Kenny Kitamura. "She uses her body well and she scores the buckets that she needs to, which is easier said than done. She takes the contact well and she was able to finish very strongly. She's very aggressive as well. She doesn't wait for the ball to come down to her, she's always in attack mode." Although Fernandez did not earn all-tournament team honors in the state tournament, her skills in the paint helped open up looks for guards Shayla Ignacio and Kizzah Maltezo. "We always had to look to to double on her since she was a big presence," said Hoe. "Since we double-teamed her, it gave those guards a better look. It was sort of a give-and-take situation when you played against Honokaa." Souza, a 5-foot-9 junior center, helped lead Damien to its first state tournament appearance in the Monarchs' first year of varsity basketball. 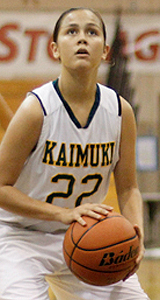 She was also the league's leading scorer with 197 points per game in 12 ILH contests. "I have to say she did a great job of what her coaches would ask of her" said Kitamura. "If she needed to help them break pressure and help out the guards, that's what she would do. She's very tenacious on defense and on rebounding. She's a good post player and they used her in other ways as well." Hawaii Baptist's Keith Sugiura was selected as the Division II coach of the year after guiding the Eagles to their third straight ILH Division II title and first state title game appearance. Coaches from across the league were enthusiastic when asked to talk about the job that Sugiura did this year. "I have so much respect for coach Keith because he's been running a solid program for years, and I'm glad he's getting recognition because he deserves it," said Kitamura. "They run a solid, clean program and I respect them for that. They play to their strengths and they always get the most of the talent that they have, and all the credit goes to him,"
"One thing about Keith that I like or admire is that he's so humble," added Tanaka. "The way he coaches, I just admire that. He's never too excited or too low, and he's always giving instructions to his ladies. If I had a daughter that had an opportunity to play for Keith, I would tell her to go in a heartbeat." The Second team is comprised of Ignacio, Hawaii Baptist junior guard Stephanie Dang, University High senior swingman Markayisha Masani, Kamehameha-Hawaii senior forward Makamae Gabriel and Aiea junior post Kyle Johnson.